I get down from the auto rickshaw at the Temple Road in Malleshwaram – one of the oldest settlements of Bangalore. I take a seat outside the ornate compound wall of the ancient Nandi Bull temple – Sri Dakshina Mukha Nandi Thirtha Kalyani Devasthana – and wait for Renu, who is running a few minutes late. Opposite the road, stands the golden domed Durga and Narasimha temples next to each other and a Ganesha temple to the right. The sounds of chants, drum beats and bells emerge from these ancient structures simultaneously as they start their morning rituals. The morning is windy, with thick gray clouds hanging in the skies, above the Gulmohar lined street. An old woman with matted locks of tied-up hair sits underneath the canopy of an old banyan tree. Her wrinkles, as old as the banyan tree itself, stand testimony to the many seasons of life she must have weathered. Next to her, a flower seller is busy packing small plastic bags with coconuts, incense sticks, and vermillion and placing it near the heaps of jasmine, roses and marigold garlands. Unlike other Indian temples, this temple has no mandapa – a very uncommon feature. Crows make a cacophony along with the parrots and cuckoos, on the overhead branches. I finally spot Renu and get up to meet her. We enter the huge archway, with a giant Nandi Bull statue atop it and walk down a few steps onto the cold and wet stone pathway leading to the sanctum sanctorum. This underground temple, which is said to be 7,000 years old, remained buried under earth up until 16 years back. It was found by labourers digging the site for a building’s foundation and since then there have been efforts to preserve this heritage. Another set of stone steps leads us down to the main temple building housing the Shivling at the far end, with a large black granite Nandi Bull statue, resting on a stone slab on top. Unlike other Indian temples, this temple has no mandapa – a very uncommon feature. In the middle of the complex, is a square pond and the corridors surrounding it, are supported by stone columns and adorned with small brass bells suspended with chains from the ceiling. We offer our prayers at the altar and then sit on the cold stone steps leading down to the pond. About 15-20 water turtles swim in its murky green calm water which is occasionally disturbed by black fishes somersaulting out of it. A few turtles climb out of the water and onto the steps displaying their moss laden shells. 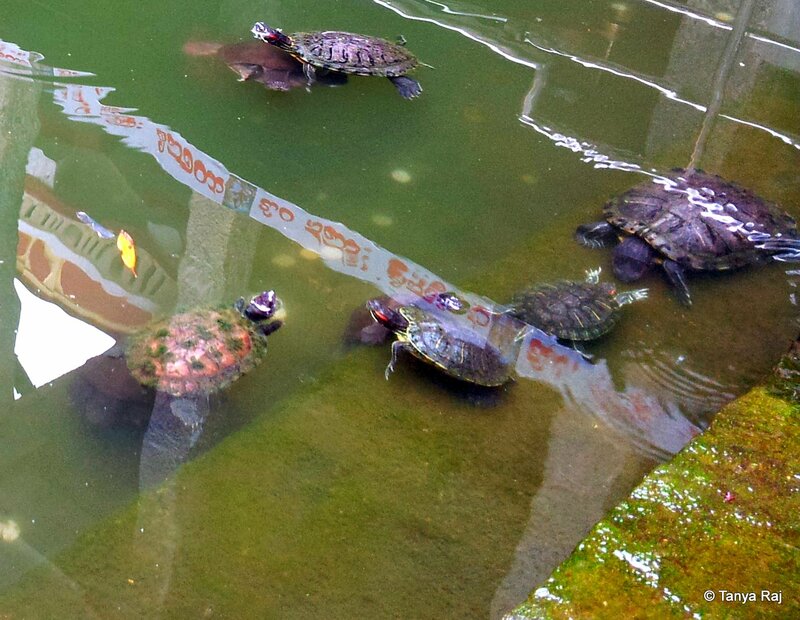 Turtles in the temple pushkarni. 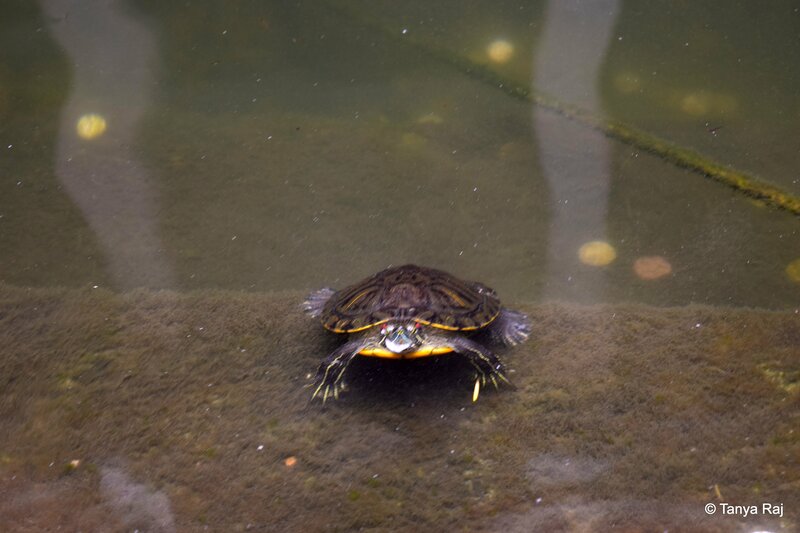 A lone turtle poses for the camera. “This is a very Jagrit Mandir. It is said that whatever you wish for here, comes true,” Renu tells me. We both decide to take a chance and throw a coin into the pond before making a silent wish. As I open my eyes, I notice a woman in pink salwar bend down at the small Nandi Bull statue across the pond and whisper in its ear. “What is she doing?” I ask Renu. “It is said that women should whisper their problems into the bull’s ears and they reach God, whereas men are supposed to place their index finger and thumb on the bull’s horns and see the Shivling through it. Devotees believe that this solves their problems,” says Renu. The Nandi Bull statue that sits at the entrance of the temple, right opposite to the Shivling. This temple is unlike any other. The large Nandi Bull on the stone slab above the Shivling is unusual and unique. 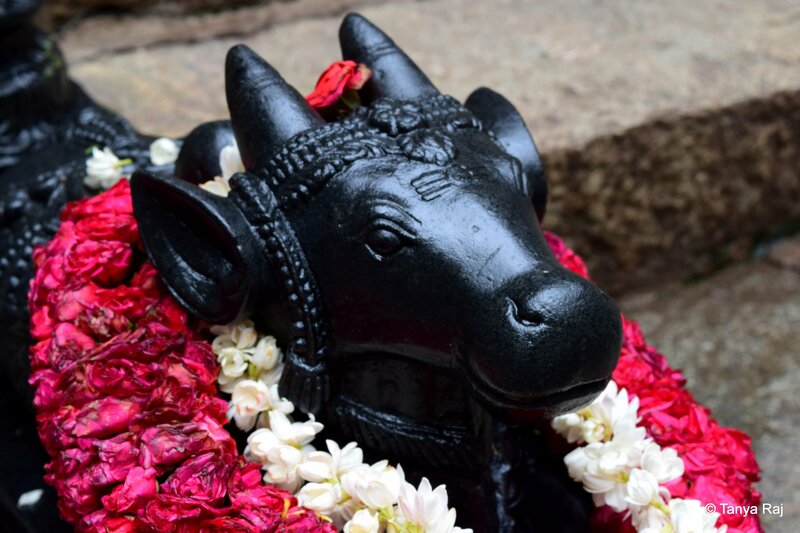 A stream of water flows out of the bull’s mouth and falls on the black graphite Shivling through a hole in the upper slab. We approach the head priest of the temple – Ravi Shankar Swami – to know more about the place. He is a short, thin, middle aged man wearing an orange dhoti, with sacred ash smeared in three horizontal lines on his forearm, shoulders, and back and a white thread (Janeu) running across his bare body from right shoulder to left hip. “Chhatrapati Shivaji Maharaj’s father – Shahaji – used to come, pray at this temple,” he tells us. “The water that is falling on the Shivling, where is it coming from?” I ask him in English, which Renu translates into Kannada. “No one knows, it’s a mystery. The water flows with the same intensity all year round. It falls on the Shivling which then flows into the 15 feet deep central pond. An underground pipe connects the pond to the outer well. The well was used to water the fields in earlier days when there were no houses. But no one knows where the water is originating from,” the Swami informs. 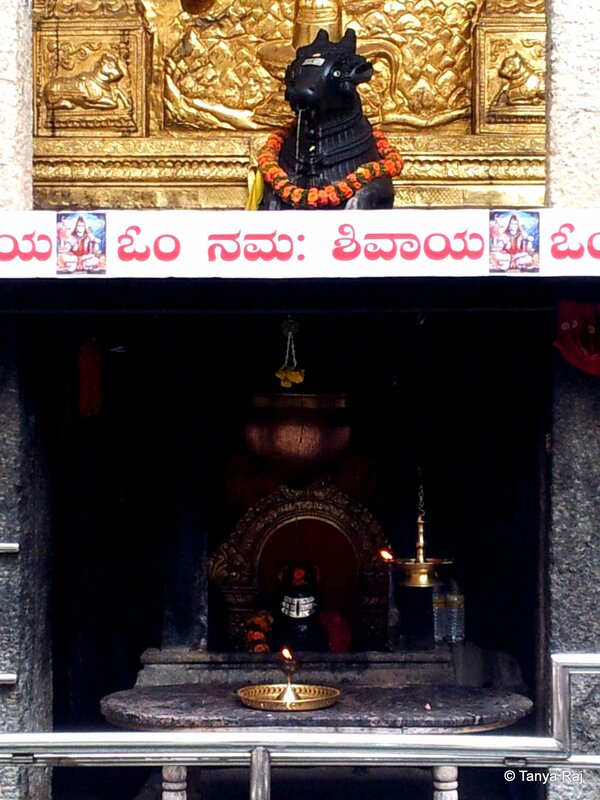 A stream of water flows out of the bull’s mouth and falls on the black graphite Shivling through a hole in the upper slab. 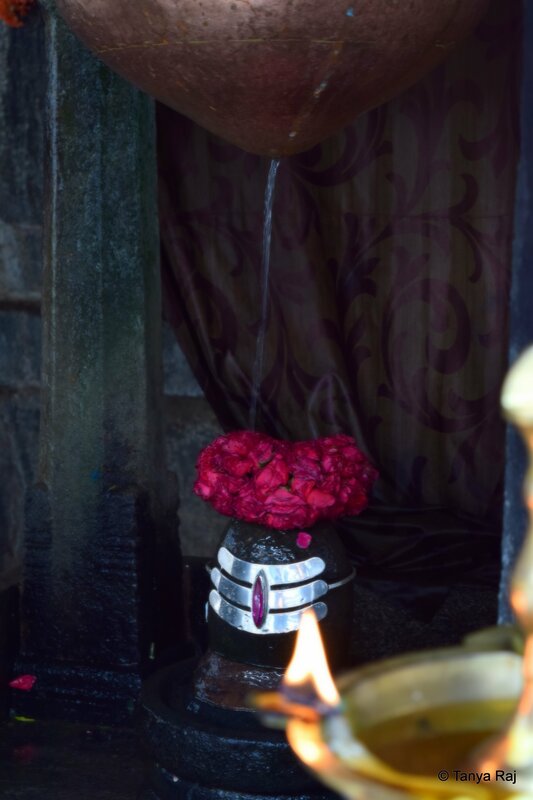 The water from the upper statue falls onto the Shivling as the foreground is illuminated with an oil lamp. I look around this remarkable place; something I have never seen anywhere and then turn my attention to the priest again. “The temple was underground for a very long time. Since it has been found, we have not changed anything inside the sanctum sanctorum. The only changes have been to the outer walls and garden,” the priest tells us further. “This is a very unusual temple. There is no mandapa covering the structure and the Nandi Bull is on top of the Shivling, instead of, in front,” I state. “Yes, and we have tried to keep everything intact. Many people offer to place marble and granite flooring, but we don’t allow that,” says Ravi Shankar Swami. 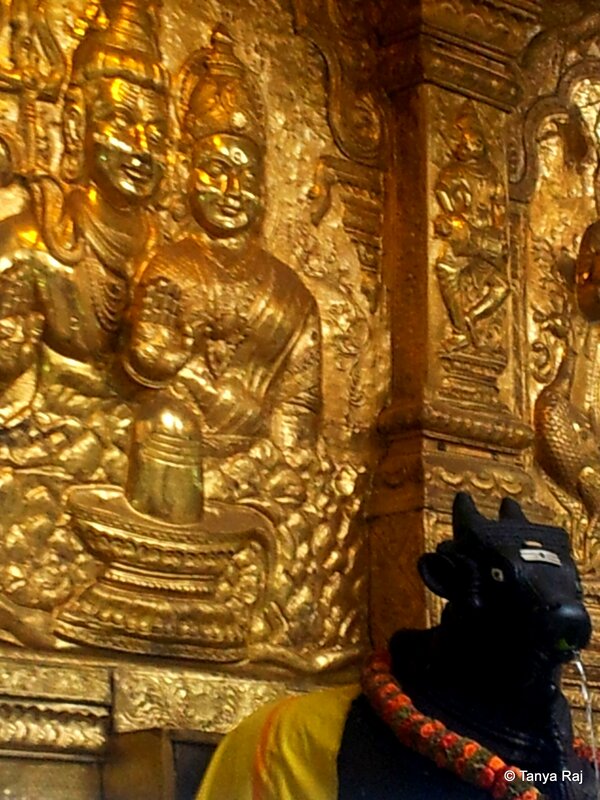 The Nandi Bull statue against the backdrop of an elaborately carved wall. We thank him for his time and go back to sitting near the central pond. The peace and quiet of this place have the power to transport you back in time. The stone pillars, pond, and bells, everything tells the stories of a bygone era. And if you sit here long enough, you can almost hear the chants, mantras, and bells from those ancient times ringing in its every column. 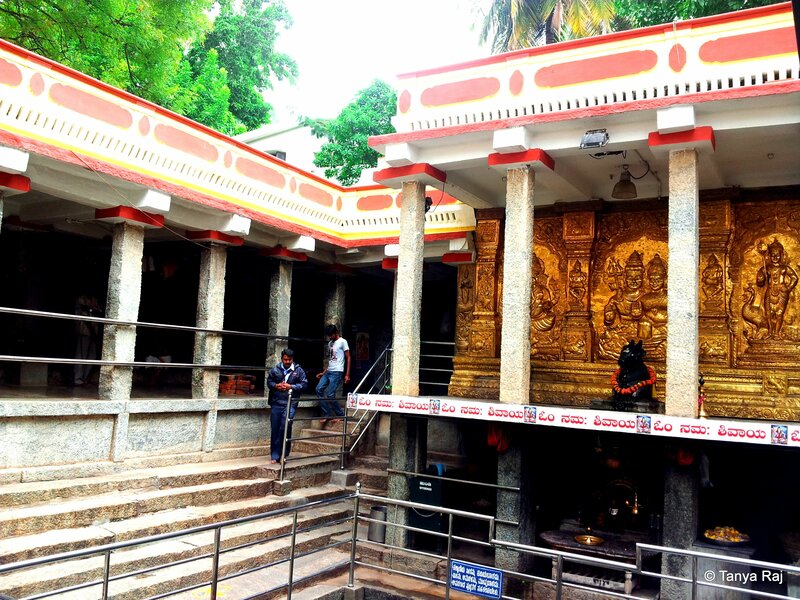 The temple is located on Temple Road at 15th Cross in Malleshwaram (behind the Sai Baba Temple), Bangalore. Sampige Road is the best route to get to this place which is open in the mornings from 8 a.m. to 11 a.m. and in the evenings from 5 p.m. to 8 p.m. There are no admission costs.